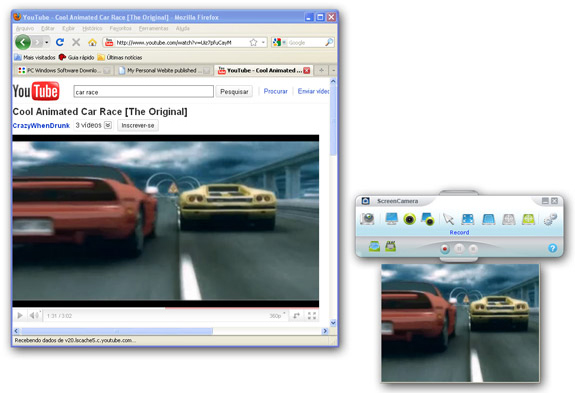 Turn your desktop into a webcam: share it and record it! You may have come across screen recording applications before -- you know, the apps that let you record everything that happens on your computer desktop. But what did you really do with those recordings? Record silent videos of your mouse gliding across your smooth, app-laden landscape? Did you pick up a microphone and do a voiceover? Well, with ScreenCamera Toolbar, you can record you on-line conversations and chats, record and stream your desktop, all while providing play-by-play audio and video with your webcam! As a desktop recorder, ScreenCamera Toolbar is second to none, featuring an intuitive toolbar offering single-click access to a variety of functions. You can choose to follow the mouse cursor, or select any active window or region of the desktop. Plus, with the ability to capture video on the webcam AND the activity on the desktop simultaneous, you'll be able to build impressive and helpful video tutorials in a snap! 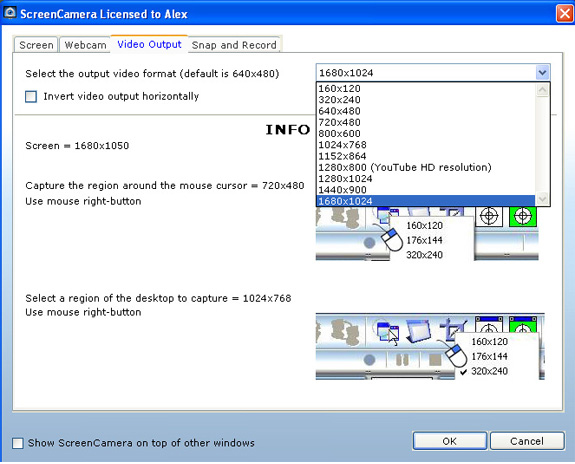 ScreenCamera Toolbar differs from all other high-def desktop recorders in one critical way: it also serves as a video camera with it's lens focused on your Windows system, allowing you to share your desktop captures on the web with anyone using free video-conferencing and video-streaming apps and websites like Skype, UStream, and LiveStream. Pretty cool! And for real-time instructional videos, you can pair ScreenCamera Toolbar with your webcam to broadcast yourself and your screen activity! In addition to all of its great applications as a video tutorial recorder and streamer, ScreenCamera Toolbar also works as a webcam splitter, letting you use your webcam on multiple applications simultaneously! ScreenCamera Toolbar opens a whole new world of possibilities for your webcam in a lightweight and intuitive app! Once you try it, you'll wonder how you ever got along without it. Please note: for an additional fee business owners can purchase the ScreenCamera SDK which allows the application to be automated remotely. Please note folks, Microsoft trusts ScreenCamera enough to list it in their Center of Compatibility! Record your on-line meetings and conversations! 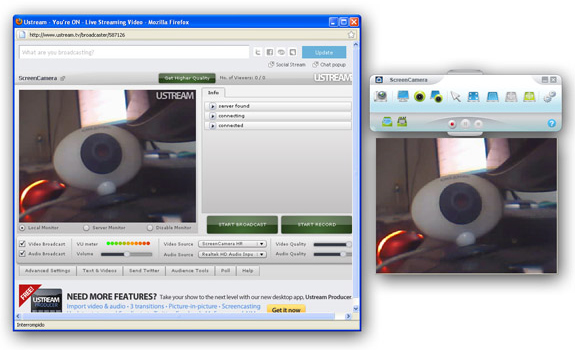 Use your webcam in multiple applications, simultaneously! Stream or record video of your PC's desktop. Provide support or give demonstrations without leaving your location. After you purchase ScreenCamera Toolbar it may be used indefinitely. ScreenCamera Toolbar is licensed per user, so if more people are going to use ScreenCamera Toolbar you will need to purchase additional copies. Each license allows installation on all owned computers, and ScreenCamera Toolbar may be used at exactly the same time on each of them. Upgrades to future versions of the software will be free for 12 months. For versions after that, upgrades will require additional payment, which will be discounted by 60%. 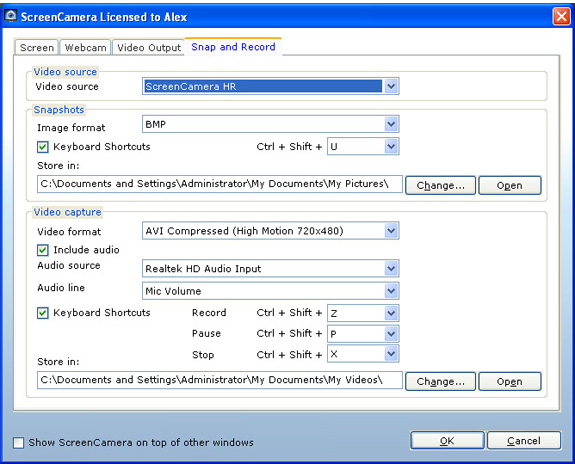 Alex Ferri ScreenCamera works on Windows 8.1 . I have it installed and running normally under Windows 8.1 . Can you tell me more in details? Gunderic Hagen I just tried to download the trial to see how it works and got a screen saying that my trial has expired(! ), Buy Now, etc. When I clicked on exit I got ....nothing. Pretty confusing. Why do you do that? Alex Ferri That happens because you have trialed ScreenCamera on the past. Send me an e-mail at support pcwinsoft.com and I will respond with an extension key which will give you 10 more days to test it. Alex Ferri I sent an extension of trial key to a Eduardo Belgrano, hope that is related to you. Gunderic Hagen I downloaded the trial version but when I try to install it, I get a message that the software needs a Ram of at least 256 MB. My computer W 7/64 bit has 16 Gb of Ram........ What is going on? Gunderic Hagen Unfortunately, I get the same message. I am interested in buying your software, but don't even know if the registered version will work. Alex Ferri Let's make a remote support session via TeamViewer. Contact me at support pcwinsoft.com and we will set up a date and time for me to connect to your PC and check it out if it is OK with you. Greg Newell I like the idea a lot but after using the trial, I would not be happy. Screen kept blacking out during the recording. I tried reducing the framerate (which I shouldn't have to) and it didn't help. I'll stick to Jing and Camtasia. (yup camtasia is a LOT more expensive but flawless). PJ F My email said 100% free...so where is it? Yousri Yacoubian When I click on the 100% off deal in my email, it takes me to 60% off page with $19.98 after discount. In the Fine Print says "Your discount coupon code will be applied to your purchase when you click the 'Buy Now' button". So, I tried to finish the deal hoping that the discount voucher would be applied automatically but it still wants my Debit/Credit card details. Roger Thomasson Sorry folks, the 100% deal was available yesterday, November 15th, for 24 hours. It is now available at a 60% discount. Constantin Florea @Yousri Yacoubian, Could you please send us at notify@bitsdujour.com the daily deal email you received today 16th of November 2015 in which ScreenCamera Toolbar is present? Yousri Yacoubian @Constantin Florea, I'm afraid. I deleted the email when it didn't work. I promise you, it was in today's offers, as a business email, I check my emails more than once a day. Today had 2 free offers, this one as well as the Wordpress one. Constantin Florea @Yousri Yacoubian, When this happens again, please forward the email to notify@bitsdujour.com letting us know of the issue. I am also subscribed to receive both Mac and PC deals and in my case the latest daily deal email mentioning ScreenCamera Toolbar is from 15th of November 2015 at 8:37 AM EST (that's 5:38 AM PST). The email I received was sent correctly because the ScreenCamera Toolbar promotion started at 3 AM EST on the 15th of November and ended 24 hours later. Divo Tech its works now thanks ! btw Win 7-64 i have ! John Goodwin how come it is cheaper to buy this right from the website than buying it through BitsDuJour? Constantin Florea @John Goodwin, I am sorry about the issue. The actual purchase URL had the correct prices. Only the prices in this promotion page were incorrect. I updated the prices in the promotion page to match the prices of the purchase URL used. But when trying to order the pricew is USD 36..... How come? Alex Ferri The price of ScreenCamera is $49.90. On the time of the promotion we were trying out a new price to verify if there were an increase on conversions and the result of the experiment was that the low price was discarded and the old price came back into play which is $49.90 but I can offer you ScreenCamera for the price you want $11.90. Send your request to pr[at]pcwinsoft[dot]com and I will reply with a link to purchase ScreenCamera for $11.90. Terry User Clicked on the buy now deal and no discount, seems to be kind of a ripoff. Doris User Mr. Ferri, I waited all day for a reply from you, and now the "deal" has passed. I was not the only one who waited. And now, even the thread of comments from the January 13, 2019 offer appears to be gone. I'm not sure why you would put up an offer, and then not follow through when there are issues with customers actually taking you up on it. You would get far fewer complaints if you simply ensured that you've provided *clear instructions* on finding/dealing with/downloading your software ... and your lack of dealing with some of those who weren't able to navigate the instructions you did provide has certainly not made you any happy customers. Since the entire thread from yesterday's offer is gone, I felt that, in good conscience, I needed to write this message for there to be a warning/reminder to those who may deal with you in the future. Trial dialog > Click ‘Register’ > Mark ‘Send key to my e-mail’ > Click ‘Next’ > Then enter the e-mail address you used to register > Then click ‘Send’. The key is sent to your e-mail address. Trial dialog > Click ‘Register’ > Mark ‘Enter key’ > Click ‘Next’ > Then enter the key you have received on your e-mail > Then click ‘Authenticate’. Record EVERYTHING That Happens On Your Screen!